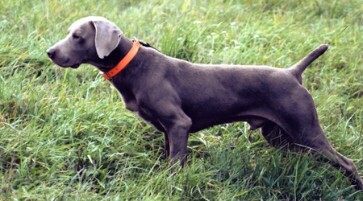 If you are looking for a hard hunting, stylish gun dog who is also a loving family companion, you are in the right place! This exciting pedigree promises pups with big run, awesome style on point and impeccable bird finding ability in the field paired with calm, affectionate, devoted temperaments at home. While both parents are on the smaller end of the breed standard, they are certainly not short on heart! "Indy" has multiple National Field Trial Placements to his name and both he and Murphy have multiple All-Breed Field Trial placements from major entries. Murphy has produced one other litter and of the 8 puppies born, 5 have proved themselves in the competitive arena. The remaining 3 pups are awesome family and personal hunting companions. Murphy's half brother Skeeter at 8 weeks old showing inherent style on point! Murphy and her daughter Corky racing to retrieve from the water. 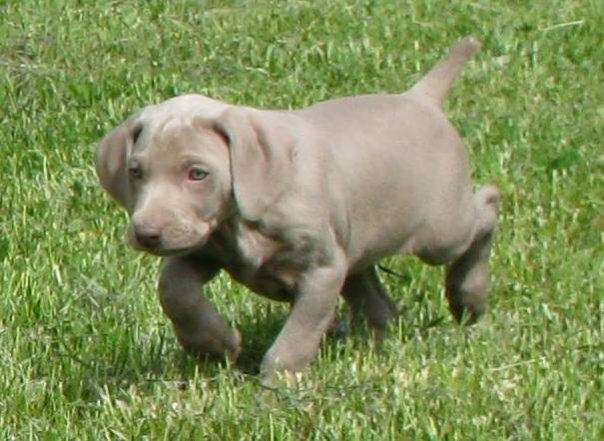 Weimaraners love to swim and are natural retrievers. 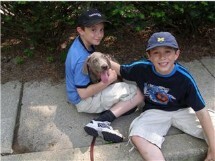 Another happy Palimar Weimaraner with his boys! Murphy's Daughter "Bella" at 6 weeks old on her first bird.